Sorry Officer Hopps!... I hope you didn't stake your badge on the match Better luck next time! This was my last piece for the night, and now I must be off to bed, but I hope you're all having a lovely night! In the NEXT panel she says, "Uhm, want to go again Chief, double or nothing?" I'll let you guess what happens after that. Nice simple drawing that gets the message across, good job. The character placement is spot on. Bogo: My game I think. Judy: Hey look, Gazelle dancing on a parade float! 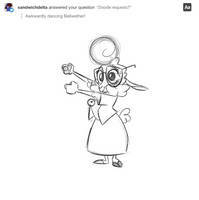 Judy removes Bogo's chess pieces. Judy: Aww, you missed it. All well, it's my turn right? Let's see... Checkmate! Haha - love the expressions here. "It seems you took my bishop. Nobody cares, check." Oh my God, he looks so cute. I love Bogo in your style! Hah! 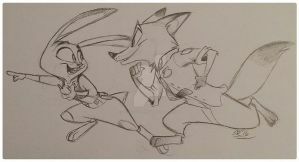 That made my day in the Zootopia fan-art section. Where do all of these requests get submitted btw? 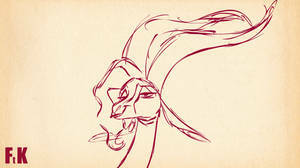 *laughs* dat master face do!